WHAT WERE THE ACTUAL 2018 TAX CHANGES? Q: What were the exact changes made to the U.S. tax code this year? The seven-bracket system remains in place, but the income levels for each bracket were tweaked. The old income levels for the seven brackets were 10%, 15%, 25%, 28%, 33%, 35% and 39.6%. The new rates are 10%, 12%, 22%, 24%, 32%, 35% and 37%. Though you will still need to show proof of coverage for the 2017 and 2018 tax years, there will be no penalties for those who do not have adequate health coverage starting in 2019. In 2017, the standard deduction for the single taxpayer was $6,350, in addition to one personal exemption of $4,050. 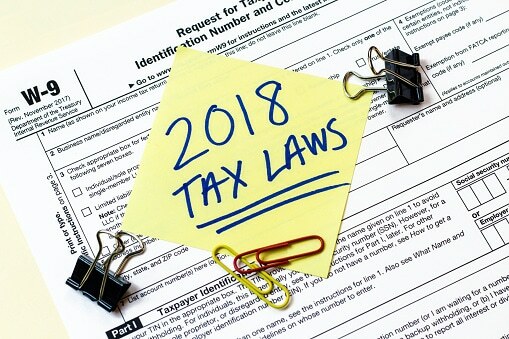 For 2018, those deductions will be combined into one larger standard deduction of $12,000 for those filing separately, and $24,000 for joint filers. Deductions and credits for children age 16 and below have doubled from $1,000 to $2,000. Before the current changes, the 40% estate tax applied to the portion of an estate valued at $5.6 million for the individual, and $11.2 million for a married couple. For 2018, taxpayers filing as individuals will be granted an exemption of $11.2 million, while married couples will have a $22.4 million exemption. The new tax bill has expanded the available use of funds in a 529 college savings plan to include other levels of education. There have been slight changes made to several deductions. Mortgages – All mortgages taken after Dec. 15, 2017 and totaling up to just $750,000, will qualify for a deduction. Charity – Taxpayers can now deduct as much as 60% of their income for charitable donations. Medical expenses – The cap for the medical expenses deduction has been cut to 7.5% of Adjustable Gross Income. This change actually is retroactive to the 2017 tax year and will only apply through 2018. State and Local Taxes (SALT) – The total SALT deduction, which includes property and income tax, cannot exceed $10,000. The corporate tax rate was lowered to a flat 21% on all profits. The new tax law features a one-time repatriation rate of 15.5% on all liquid assets and 8% on non-liquid assets held overseas. For a single taxpayer or head of household, the AMT rate will increase from $54,300 to $70,300. For married couples filing jointly, the AMT rate will increase from $84,500 to $109,400. For married couples filing separately, the AMT rate will increase from $42,250 to $54,700.